Last year I put together the Christmas party for Ruby's preschool class. After the cute Frankenstein cups they had at Halloween, I knew I had to find something cute to do for their Christmas drinks. 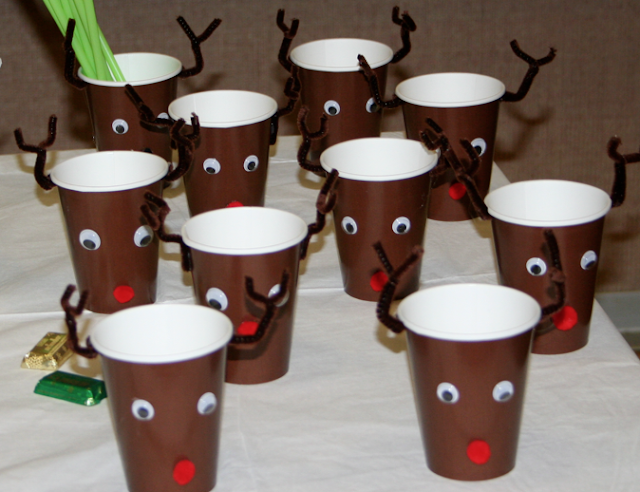 With a little, red pom pom, two googley eyes, and two brown pipe cleaners I converted some brown paper cups into reindeer cups. Rudolph cups to be exact. Hot glue worked perfectly on everything. Now my grandmother would never approve of these. To this day I am not allowed to drink hot chocolate from a mug while the spoon is still in it. I will poke my eye out! So the pipe cleaner antler would never fly with her. I gave each of the kids a straw, but you could make the antlers out of paper or leave them off all together. And if you wanted to use clear cups, you could serve chocolate milk. Or, forget drinking out of them at all and use them to hold candy or small gifts.